Buy Zaytoun Palestinian Medjool Dates - 250g in the UK from our online shop or directly from our independent Scottish store. If you want to automatically receive an email when 'Dried Medjool Dates' is back in stock, just leave your email address below. The 'Medjoul' is the finest of dates. It is grown in the Jericho area which has the perfect climate for producing these delicious, soft and succulent dates. The 'Medjoul' is the finest of dates. It is grown in the Jericho area which has the perfect climate for producing these delicious, soft and succulent dates. They are sourced through the 'Palm Farmers Cooperative' and are a vital source of income in this area. We sell real Zaytoun and other Dried Fruits directly from our shop in Scotland and online throughout the UK. View more products from Zaytoun. Where can you buy real Dried Medjool Dates safely online? If you are wondering where you can buy Zaytoun Palestinian Medjool Dates - 250g safely online in the UK, then shop with us. 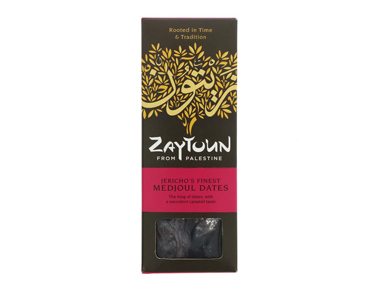 Dried Medjool Dates - Zaytoun Palestinian Medjool Dates - 250g in Dried Fruits and Foods.